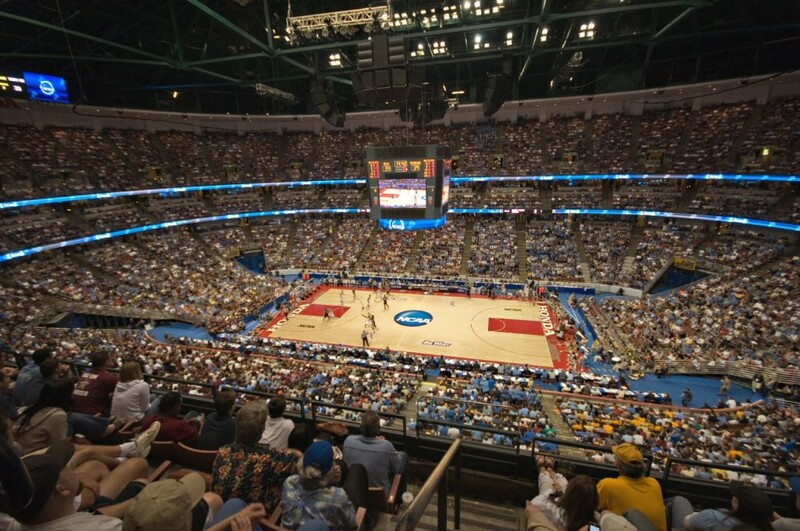 March Madness begins in earnest with Louisville vs. Minnesota (CBS, noon), LSU vs. Yale (truTV, 12:30 p.m.), Auburn vs. New Mexico State (TNT, 1:20 p.m.), Florida State vs. Vermont (TBS, 1:50 p.m.), Michigan State vs. Bradley (CBS, 2:30 p.m.), Maryland vs. Belmont (truTV, 3 p.m.), Kansas vs. Northeastern (TNT, 3:50 p.m.), Marquette vs. Murray State (TBS, 4:20 p.m.), Nevada vs. Florida (TNT, 6:45 p.m.), Kentucky vs. Abilene Christian (CBS, 7 p.m.), Villanova vs. St. Mary’s (TBS, 7:15 p.m.), Gonzaga vs. Fairleigh Dickinson (truTV, 7:15 p.m.), Michigan vs. Montana (TNT, 9:15 p.m.), Wofford vs. Seton Hall (CBS, 9:30 p.m.), Purdue vs. Old Dominion (TBS, 9:45 p.m.) and Syracuse vs. Baylor (truTV, 9:55 p.m.). Abby steals her stuff on “Broad City” (Comedy Cntral, 10 p.m.). On “The Other Two” (Comedy Central, 10:30 p.m.), Chase has an album release party. Gordon and Bruce find the mastermind behind the city’s chaos on “Gotham” (Fox, 8 p.m.). On “Grey’s Anatomy” (ABC, 8 p.m.), they’re trying alternative medicine on Seattle Grace with mood rooms. Sam and Dean face a new monster on “Supernatural” (CW, 8 p.m.) and Sam faces one on “Better Things” (FX, 10 p.m.). Lupine Nyong’o, Winston Duke and Kirsten Gillibrand visit “Desus & Mero” (Showtime, 11 p.m.). “Superstore” (NBC, 8 p.m.) gets snowed in, and so does Karen on “Will & Grace” (NBC, 9:30 p.m.). Morning announcements are a chore on “A.P. Bio” (NBC, 8:30 p.m.). On “Brooklyn Nine-Nine” (NBC, 9 p.m.), a therapist reports one of his patents is missing. A diplomat goes on trial on “For the People” (ABC, 10 p.m.). A couple goes “Building Off the Grid” (Discovery, 9 p.m.) near a volcano in Hawaii. Hope tries to straighten things out on “Legacies” (CW, 9 p.m.). “Station 19” (ABC, 9 p.m.) rescues people stuck on a train. A defense attorney is raped on “Law & Order: Special Victims Unit” (NBC, 10 p.m.). “Million Dollar Listing Los Angeles” (Bravo, 9:30 p.m.) goes to Dubai. The story of the soccer star is told in “Antoine Griezmann: The Making of a Legend” (Netflix, streaming). Rapper Waka Flock and his wife Tammy renew their vows on the special “Waka & Tammy Tie the Knot” (WeTV, 10 p.m.). Rachel Maddow, Tiffany Pollard and Joel McHale appear on a “Grease”-inspired “RuPaul’s Drag Race” (VH1, 9 p.m.). The crew on “The Orville” (Fox, 9 p.m.) open a time capsule from 2015. It’s down to Carson Kressley and The Situation on “Hollywood Medium with Tyler Henry” (E!, 8 p.m.). Turner Classic Movies’ Thursday night spotlight on journalism movies has “The China Syndrome” (8 p.m.), “Network” (10:15 p.m.), “His Girl Friday” (12:30 a.m.), “It Happened One Night” (2:15 a.m.) and “Libeled Lady” (4:15 a.m.). Daytime TCM movies all happen at sea in “Melody Cruise” (6 a.m.), “The Captain Hates the Sea” (7:30 a.m.), “’Til We Meet Again” (9:15 a.m.), “A Majority of One” (11:15 a.m.), “The Last Voyage” (2 p.m.), “Luxury Liner” (4 p.m.) and “Romance on the High Seas” (6 p.m.). From Japan, there’s another early morning game of Oakland vs. Seattle (ESPN, 5:30 a.m.). Spring baseball has Miami at Mets (MLB, 1 p.m.). Soccer has Belgium vs. Russia (ESPN2, 3:30 p.m.) and Ecuador at U.S. (ESPN2, 8 p.m.). Women’s college lacrosse includes Maryland at Penn State (ESPNU, 5 p.m.). College wrestling has its own NCAA championships (ESPNU, noon; ESPN, 7 p.m.). And bowling has its PBA World Championship (Fox Sports 1, 8 p.m.). Kelly Ripa and Ryan Seacrest: Liam Hemsworth, Trevor Noah, Christina Hendricks, Avril Lavigne. The View: Maddie Corman. Ellen DeGeneres: David Letterman, Dermot Kennedy. Stephen Colbert: Kit Harrington, Amber Tamblyn, Hozier (rerun). Jimmy Kimmel: Sean Penn, Retta, Jenny Lewis. Jimmy Fallon: Julia Louis-Dreyfus, Joel Kinsman, cast of “Ain’t Too Proud.” Seth Meyers: Alexandria Ocasio-Cortez, Andrew Rannells, Carla Lalli Music. James Corden: Matt LeBlanc, Will Arnett, Broods (rerun). Carson Daly: Machine Gun Kelly, Parquet Courts, Karley Sciortino. Trevor Noah: Dr. Leana Wen. Conan O’Brien: Gad Elmaleh.